I have been using black flies here and there for many years, but over the past 6 months it has become a more and more important tool in my arsenal. I recently realized that a really surprising percentage of the carp I have caught in 2014 have been on predominately black flies. Like over half - and that got me thinking. Has black been one of my most effective fly colors all along and I just never realized it? 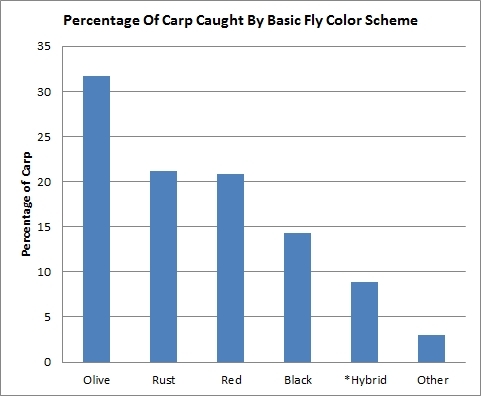 In order to answer that question I went back through my records and estimated the percentage of total carp caught with a couple of basic color schemes. The hybrid category is a combination of a red tail with an olive or black body. The first thing that may surprise you - and certainly surprised me - is how few basic fly color schemes I really fish. The second thing that may surprise you - and definitely surprised me - is how may carp I have caught on black in my lifetime. I would have certainly guessed much less than 15 percent, and when I look at this year the percentage seems to be increasing rapidly, mostly at the cost of rust. Almost the moment I finished putting that data together I got an email that was almost creepy in the level of coincidence. Tim Cammisa wanted to let me know about a new fly tying video he had put up on YouTube - about a black variant of the Trouser Worm! And THEN within 10 minutes of first publishing this post I ran into this fascinating article about a new material blacker than black. The carp spirits have spoken and I would be foolish to ignore the message. Black is the new black. That was great information and research. Black has only done marginally well for me, yellow, white and tan flies doing the work (other than eggs,) especially in a pond I no longer fish that had aggressive large carp. But, I will admit that a black bitter bugger was hit by carp as if by a pike, brutally. I keep working with it though, as you and others seem to vouch for that color. I too have trouser worms in black. I just lack the opportunities to present a variety of flies. My favourites a rust or grey olive (recently been having great success with spirit river mottlebou which has a nice combo of these colours), usually combined with a hot spot of magenta or fire orange somewhere in the fly. As an aside I don't like a red tail on hybrids very much, I seem to do much better on brown tailed versions.